As most of you would know, I do not write about fashion as my style are often laid back easy when i am not in working clothes - and many of you would know how i would wear my "uniform" to work. I am a Cuff Person. Last i mentioned anything fashionable was the opening of the latest Cats Whiskers outlet in Jaya One. On Saturday, while waiting for my appointment with Sakae Sushi (to review their new 2012 menu, read all about it here), i found out a buddy's wife has formed a partnership to open a boutique exclusively selling contemporary fashion items for Muslimah (Muslim ladies). The boutique is known as Anglia - which successfully mixes the fashion to be both modest and has street cred. "Boring" is a past tense at Anglia. Previously only available in Singapore, they now have ten outlets in Singapore and Indonesia with a marketing office in Dubai and new counter setting up in Colombo. This contemporary label is now available in Klang Valley, specifically at Paradigm Mall, Kelana Jaya. Situated at the first floor of the mall, the boutique was opened for business recently with both the partners in business being heavily involved in the daily operation and fashion. Madam Rozita (my buddy Zailan's wife) and Mr. Nizar. Go to them for fashion advices. If one care to observe, they will notice that Anglia offers a very muhibbah mix of fashion that will appeal to all major races in Malaysia. From my observation, the varieties will suit any official functions that requires elegant and yet comfortable non-pretentious wear. To say the least, i found the collection refreshing. Enjoy some of the photos taken from the shop. As there were customers in the shop when i was taking the photographs, i was being as discrete as possible, respecting the customers and their privacy. Below are some setup on mannequins in Anglia. Customers to Anglia would be delighted to find a rack of men's shirt (short and long sleeves) which are made from the same quality material being sold. In fact, i was told that there are matching women-men setup that is very suitable to be used for event such as wedding. With that choice, couple do not need to visit the tailor to make matching clothing and Anglia might have a solution you can consider! I do not mind pink. Real man wears pink. Close up on the Men's shirt and fabric. Anglia was brought to Malaysia via the hardwork of both Mdm. Rozita and Mr. Nizar. Previously, Mdm. Rozita used to follow my buddy Zailan down to Singapore during his runs or races (Zailan run and bike) and frequent Anglia. So what started as a race support trip turns into a shopping trip that materialise to boutique providing contemporary fashion that are both demure and classy without being predictable. More over the material used in each collection are of high quality cotton very suitable for our country's hot and humid weather. Prices ranges from slightly below RM90 to high RM300++. That is pretty comparable (actually Anglia is more affordable!) to some other more generic branded clothing store where a blouse could cost anything between RM200 to RM500. 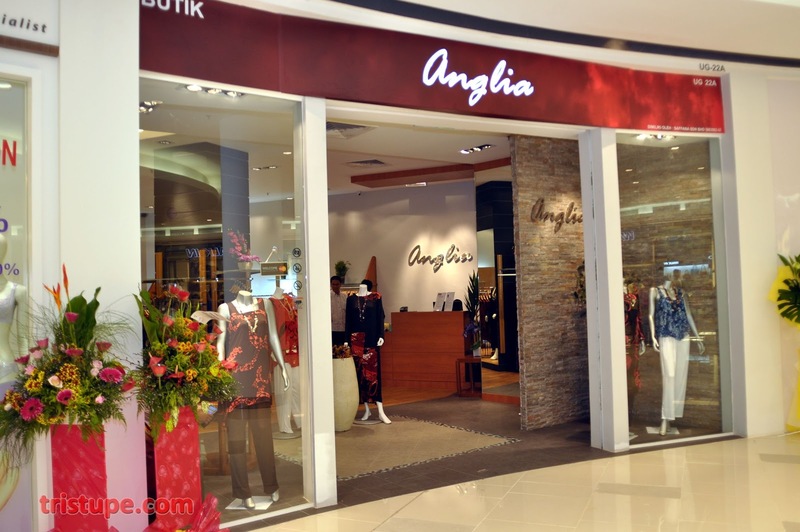 Anglia has a facebook page where customers could interact with the boutique. Find them here in Facebook and LIKE them. Alternatively, you can always be-friend Anglia Clothier here. Don't forget to visit them when you drop by Paradigm Mall, Kelana Jaya! Thanks Stupe. Will share on the FB page if you dont mind. This are great and elegant collection Anglia. I would surely consider sharing your products to my muslimah friends. They would surely love it. Personal Best For 1-Mile CLOCKED!